Yes, there is an official National DNA Day! April 25th. This year the U.S. National Human Genome Research Institute (NHGRI) is presenting an online lecture on "Harry Potter and the Genetics of Wizarding." See more at https://www.genome.gov/10506367/national-dna-day/. In Tyler, Texas, we will celebrate early on April 23 with an all-day DNA seminar to teach genealogists to begin analyzing DNA test results for evidence to apply to genealogical questions. See more at http://debsdelvings.blogspot.com/2016/04/hands-on-dna-workshop-april-23-tyler.html and http://etgs.org/meetings/etgsmtg04_a.html. Both AncestryDNA and Family Tree DNA are offering sales on DNA test kits. AncestryDNA is offering a $20 discount — $79 plus free shipping if you use the FREESHIPDNA code. Offer ends Tuesday, 26 April 2016 at 11:59 p.m. ET. Testing at AncestryDNA allows easy comparisons between your public family tree on Ancestry, if you have one, and the public tree of your DNA matches, if they have a public tree. In-depth analysis of shared DNA segments will require the test results (the raw data file) be uploaded to a third-party tool such as GEDmatch.com. AncestryDNA does not provide the in-depth analysis tools most genetic genealogists need and want. AncestryDNA uses a saliva sample. Family Tree DNA is offering a $20 discount — $79 for the autosomal DNA test called Family Finder PLUS discounts on most other Y-DNA and mtDNA tests. Offer ends Tuesday, 26 April 2016 at 11:59 p.m. ET. The Family FInder test and AncestryDNA test are very similar, but only Family Tree DNA offers Y-DNA and mtDNA tests which can be done using the same DNA sample. Family Tree DNA uses a cheek swab which can be easier for some elderly relatives. Testing at Family Tree DNA allows comparisons between your public family tree on Family Tree DNA, if you have one, and the public tree of your DNA matches, if they have a public tree. 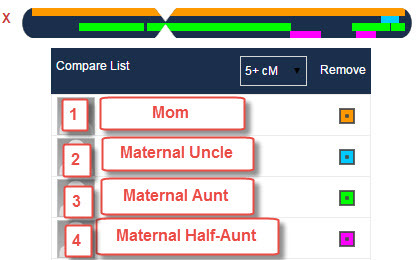 In-depth analysis of shared DNA segments can be done using the In-Common-With, Matrix, and chromosome browser tools provided by Family Tree DNA. In addition to using the company-provided tools, the raw data file can also be uploaded to a third-party tool such as GEDmatch.com. The shared segment data can be downloaded using third-party tools at DNAgedcom.com. That data can then be used in many other tools such as Genome Mate Pro and other Genetic Genealogy Tools. The prices are below, and are valid on new tests and add-ons only. Discounts do not combine with existing group discounts. Upgrades will be discounted in June. 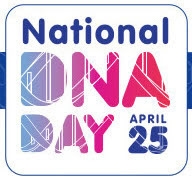 Let's celebrate DNA Day by adding thousands of test results to the databases! Debbie Parker Wayne, "DNA Sales and Presentations for DNA Day Celebrations," Deb's Delvings Blog, posted 21 April 2016 (http://debsdelvings.blogspot.com/ : accessed [date]). One of the biggest complaints of those who attend DNA presentations is that the concepts seem to make sense as one listens, but when you try to apply the concepts to family research it no longer seems as clear. The East Texas Genealogical Society (ETGS) has asked me to present a one-day, hands-on DNA workshop on Saturday, 23 April 2016, in Tyler, Texas. This workshop will cover the basics of DNA inheritance for the novice then move into some more advanced techniques used to analyze the DNA test results to answer genealogical questions. All of the types of DNA tests used by genealogists will be discussed. The novice and intermediate level genetic genealogist should learn something new in this workshop. The cost is only $10 for ETGS members or $20 for non-members. Walk-ins are welcome, but pre-registration guarantees handouts will be available. Information on registration can be found online at http://etgs.org/meetings/etgsmtg04_a.html. Registration can be paid online using Paypal or can be mailed to the society. If you want to order lunch, registration must be done by April 15th (only two days from now). A review of genetic genealogy basics such as the inheritance patterns of each type of DNA used for genealogy. This includes an introduction to some of the tools to be illustrated in later sessions. Illustration of a real-life case study using the latest tools and techniques to analyze mitochondrial DNA (passed along the matrilineal line). Illustration of a real-life case study using the latest tools and techniques to analyze Y-DNA (passed along the patrilineal line). Illustration of a real-life case study using the latest tools and techniques to analyze autosomal DNA (inherited through all ancestral lines). Debbie Parker Wayne, "Hands-on DNA Workshop, April 23, Tyler, Texas," Deb's Delvings Blog, posted 13 April 2016 (http://debsdelvings.blogspot.com/ : accessed [date]). 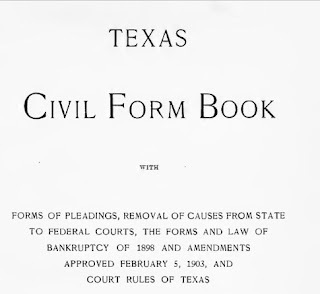 In many of my presentations and as a reply to mail list postings I have provided a reference to a Texas Civil Form Book. A recent posting on a mail list for professional genealogists reminded me I never made this available in a blog post where it might be more easily found. Several years ago I attended a BCG Education Fund Putting Skills to Work workshop presented by Barbara Vines Little titled “Working with Documents: From Discovery to What Comes Next.” During that workshop, I learned that most states have a "form book" used by clerks and lawyers when drawing up documents. These form books provide templates and example wording that can be followed to properly draw up a legal document for a specific situation. In many cases, the laws define the required wording that must be included to create a legally-binding document or a specific type of document. The form books include that wording. While not every clerk copied the exact wording used in a form book unless it was required by law, many clerks did. 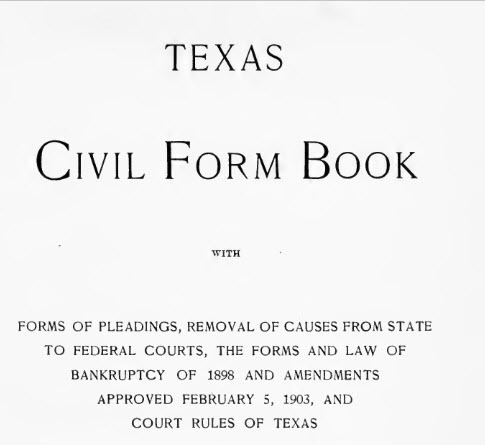 J. W. (Jonas William) Moffett, Texas Civil Form Book, with Forms of Pleadings, Removal of Causes from State to Federal Courts, The Forms and Law of Bankruptcy of 1898 and Amendments Approved February 5, 1903, and Court Rules of Texas (El Paso: Gammel Publishing, 1907); online archive, Internet Archive (http://www.archive.org/details/texascivilformbo00moffiala). The story of how I learned of this resource shows how we can all learn new things at any time. After more than twenty years of research and a decade of attendance at conferences and institutes, I had never heard of form books before Barbara mentioned it as an aside in her document analysis workshop. You never know when or where a critical piece of information about a resource will pop up. And many thanks to the BCG Education Fund for continuing to provide workshops to teach us essential skills. There are only a few seats left in this year's workshop. See http://debsdelvings.blogspot.com/2016/02/build-firm-foundation-transcribe.html for more information and for a registration link. Debbie Parker Wayne, "Texas Form Book: Decipher those difficult words," Deb's Delvings Blog, posted 7 April 2016 (http://debsdelvings.blogspot.com/ : accessed [date]).